Mazda's factory LMP2 race team, B-K Motorsports, arrived early last week at Long Beach, California to build on our momentum from a solid finish just two weeks prior at St. Petersburg. 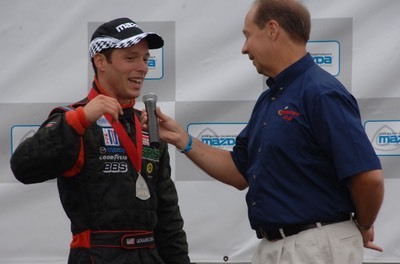 My teammate Ben Devlin was as eager to drive as I was to learn a track so rich in history, but brand new to me. 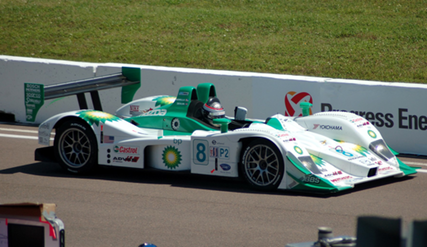 Did I have enough experience in the BP Lola B07-46 Mazda LMP2 car to learn a new track? We were allowed two test sessions Thursday afternoon. Although they were cut from 60 minutes to 50 minutes each, it was just barely enough time to learn the course and try a few small changes. I drove the first 50 minute session, Ben did the second. What a blast! Long Beach may not have the fastest corners, but it has a satisfying variety and plenty of technical challenge. In fact, the slowest corner on the track, the famous hairpin leading onto the front straight, was the most difficult corner to get right. Friday brought us a single 40 minute practice session, in which I built my confidence to a new level, while Ben sorted an analysis on tire choices made available by our technical partner Yokohama. 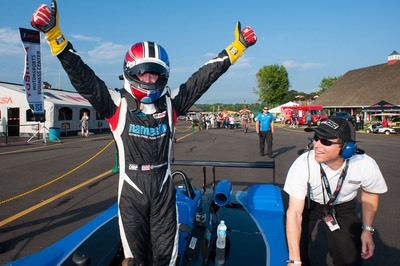 In racing, you are sometimes presented with an opportunity to "go big or go home". We're here to win, so we went big! It was an educated choice, based on driver feedback, tire analysis by our engineers, and weather forecast. Qualifying was done later on Friday. Our position was set, and our confidence was high that our race pace would be competitive. Saturday morning I was in the car for the 15-minute warmup session. Everyone knows warmup times don't mean much, as teams simply try a few settings they might want for the race. But drivers don't exactly slouch. It was with smiles on faces that we found the BP Mazda in position #1 overall on the scoring monitors until the very last lap of the warmup, where four cars beat us at the last minute. Again, warmup times don't mean much, but this brief moment of topping the time charts spread good vibes all over our team. The team asked me to start the race. It would be my first time starting a race in the ALMS, in only my second race. Was it fun? You bet! The hairpin spread things out a little at the green flag, but getting into turn 1 was the usual controlled chaos you would expect in a competitive series. Our initial pace was strong, as I was able to stay with the Dyson Porsche RS Spyders. After only a couple of laps we had a full-course caution due to a stalled car on course. On the restart I was able to follow those Dyson Porsches again, but something wasn't right. After a few laps, they were gapping me easily. Uh-oh. The little handling characteristics of the car had begun to amplify. This couldn't be happening. We just didn't know the weather was going to get so hot (so much for the forecast). Before long, I was sliding in nearly every turn. My engineer was on the radio asking me to push. Did I ever. It was probably one of the most challenging drives I've done in a while. It was like the car had 900 horsepower and the tires were half as wide. Our gamble didn't pay off...and there was no option for pitting. I had to stay out until the fuel had run out. When we pitted for fuel, tires, and driver change, we switched to a more conservative tire, better suited for the hotter temperature (the tires you qualify with must be used for the opening stint, so no option to do this at the start of the race). 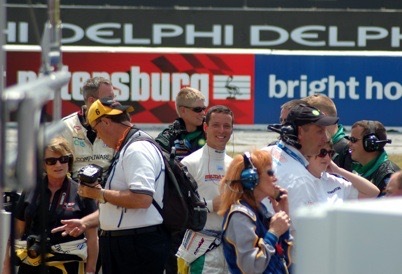 Ben was immediately on pace staying with the other LMP2 cars. Lessons like this make us stronger. Just thinking about what we might do at the next race has me pumped. Many thanks to everyone at B-K Motorsports, BP, Mazda, and Yokohama. Many thanks also to the stars of "Speed Racer" The Movie who made a guest appearance this weekend. You might notice a few Speed Racer logos on our suits and race car. Lots of fun. Thanks to the promoters and people who make the Long Beach GP possible. It's an impressive and complete race weekend staged right in downtown Long Beach. Pretty good example of racing paradise. The nirvana of competing in the American LeMans Series has finally calmed down to the point I could sit and write a few words. 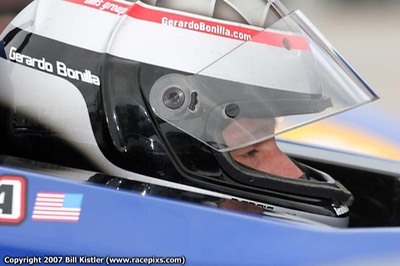 The B-K Motorsports BP Mazda team fielded a successful LMP2 entry in this past Saturday's ALMS Acura Sports Car Challenge of St. Petersburg. This story is not only one of running a trouble-free race on the streets of St. Pete, but also of a major comeback from a destroyed race car that ended our Sebring season opening effort in heart wrenching fashion only three weeks prior. 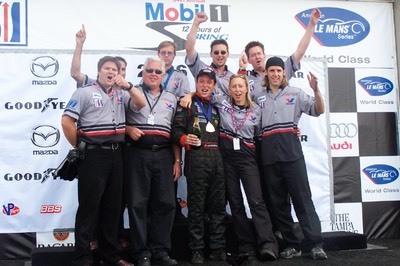 With renewed focus and team spirit, our crew gave Ben Deviln and myself a fast and reliable race car. 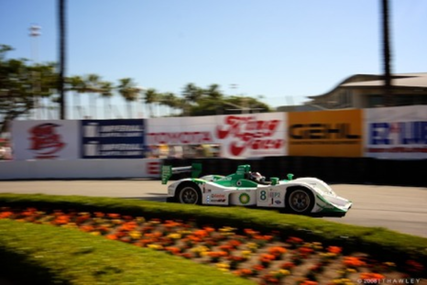 We had only two practice sessions to re-baseline our Yokohama tires, Lola chassis setup, and Mazda MZR-R engine. 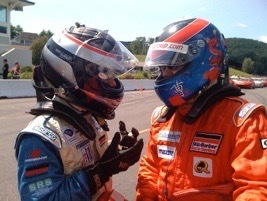 Ben was generous with his time to coach me around the St. Pete street circuit, a track I had not yet raced on. Compared to other street circuits, this one must be one of the best in North America thanks to a smooth surface and great corner variety. While dangerous, there's still something special about racing so close to concrete walls and getting away with it (most of the time). Ben Devlin started the race putting in a great 45 minute stint. His time in the car gave the team further evaluation of what our car needed to get faster. When it was my turn to drive, I was calm but focused. I had waited such a long time for this day, it was really special. Everything you can imagine about driving this car in this type of race happens, and so much more. From managing the race pace, traffic, radio communications, caution periods, restarts on cold tires, buttons to push, its all pretty cool. Certainly, with more experience, much of this will be trivial and old hat. But today, I'm a rookie, and that means enjoying quite thoroughly all the little details. We finished 7th overall, 6th in class. We are hungry for more, but this is a great way to come back from adversity and set a tone for the coming season. Catch us as we go to slay more giants.